The Karlsruhe Europahalle has been carefully thought through to guarantee optimal flexibility. This makes it more than just a sports complex. It’s also an ideal location for concerts and events. 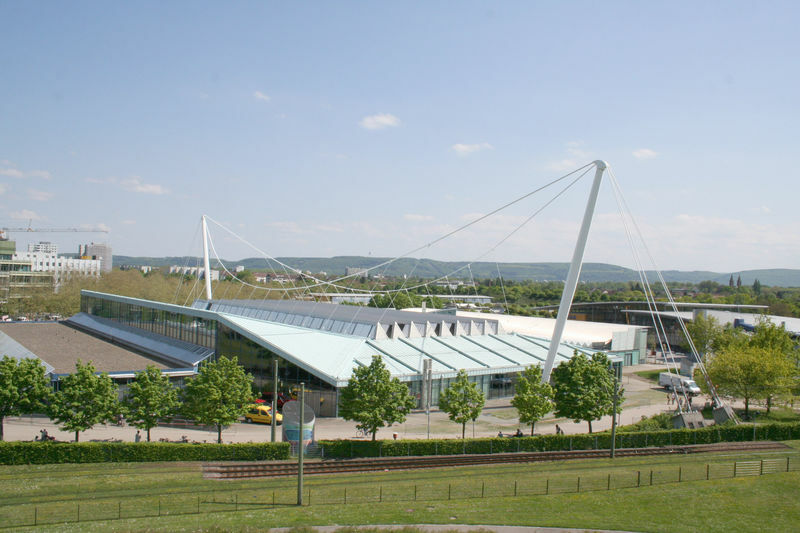 For years, the Europahalle has stood for exciting sporting events in Karlsruhe and beyond. Each year, it’s the venue of choice for the IHM Meet, where international track and field stars dazzle spectators with their athleticism. The Europahalle consists of a main hall with 4 parts and has a total capacity of 9,000 seats. In the administration area, there are four ticket windows, a ticket office, 78 press desks, eight soundproof radio moderator booths and a spacious foyer with plenty of room for information, promotional or merchandising stands. The complex offers a variety of additional spaces for different events: a warm-up hall (405 m²), multipurpose space (360 m²), the Karl-Benz hall – which can be split into two rooms via a folding partition (KBS 1+2 = 260 m²) – and the Karl-Wolf hall (208 m²). Suitable parking spaces for broadcast vehicles are adjacent to the halls.